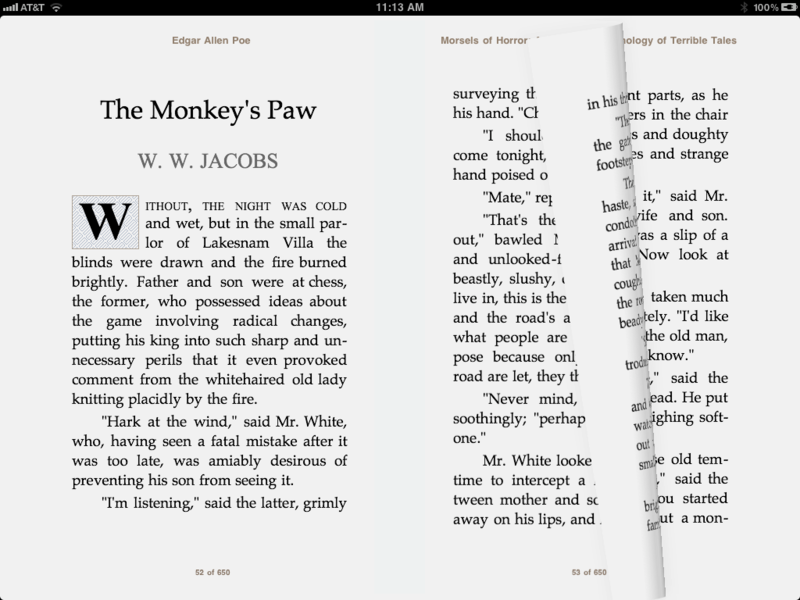 Amazon just announced it would finally begin accepting epubs from publishers, and might, someday soon, make reading them a feature of the Kindle. I just got a Kindle for the first time, because I sort of had to. I’m not finding myself cuddling it, or having separation anxiety, or developing the kind of co-dependent relationship it seems to engender in most people. I think the pages of the books I read are horrendously ugly on it; I’ll credit it for the crispness of the type, the lack of glare, and the reduced e-ink latency they’ve achieved with the latest model. And it feels good to hold. It’s light and comfortable. Too bad it perpetuates the impression most people have had of ebooks since people started trying to sell them: they’re the ugliest way to read. Way uglier than the Web, even uglier than the Web used to be. And Kindle, unfortunately, does nothing to fix that, except provide the crispest ugly fonts and typography you’ve ever seen (yes, the resolution and ease on the eye exceeds paperbacks, but don’t expect to see Jensen, or Bembo, or Garamond, here. You’re stuck with some poor stepchild font that is undoubtedly the result of Amazon’s notorious over-analytical approach to user-interaction, not the choice of anyone remotely trained in creating something visually appealing on an aesthetic level). But my biggest gripe is my recent discovery that after dumping most of my DRM-free epub collection onto the device, NONE of them work! “Q: Why doesn’t Amazon support the popular ‘e-pub’ standard used by your competitors and many libraries? A: We are innovating so rapidly that having our own standard allows us to incorporate new things at a very rapid rate. For example: Whispersync (which uses wireless connections to sync your place in a book across devices) and changing font sizes. There are so many things wrong and annoying with that answer, that I don’t even want to begin. Epub is reflowable, geared toward systems that let you change the font size, and it’s web-based, the only ebook format to take a step in the direction of connecting itself to the massive database of human activity we call the Web. But because Bezos is so intent on making Amazon so innovative that they can’t support epub, I’m stuck reading my PDFs in a severely reduced page size, or I’m resigned to just buying more books from Amazon. Which is exactly what he wants me to do.